The telecom executive hid behind a pillar as six heavily armed attackers stormed the luxury hotel and began spraying terrified guests and staff with bullets. 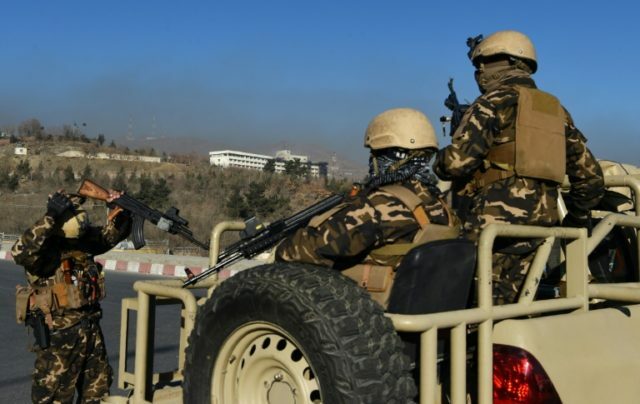 At least 18 people were killed, including 14 foreigners — six of whom were Ukrainian — in the 12-hour ordeal as the attackers engaged in a fierce gunfight with Afghan security forces. “I saw people who were enjoying themselves a second ago screaming and fleeing like crazy, and some of them falling down, hit by bullets,” Tayeb told AFP on Sunday, hours after his traumatic experience. One colleague, who had been stranded on the fifth floor of the six-storey building throughout the attack, told Tayeb that some areas of the hotel resembled a butcher’s shop with blood everywhere. The attackers were eventually killed. Tayeb, a regional director for Afghan Telecom in the western city of Herat, was staying at the hilltop hotel — not part of the global InterContinental chain — with dozens of industry colleagues from around the country ahead of an annual conference due to begin on Sunday. The gunmen shot at people who had been enjoying dinner in one of the hotel restaurants before breaking into guest rooms and taking dozens of hostages including foreigners, witnesses said. Tayeb and a few friends managed to escape to the hotel’s outdoor pool area where they hid, listening to the horrifying attack metres away. “I could repeatedly hear blasts one after another, hand grenades, they used many grenades,” he said, his voice heavy with exhaustion. “We contacted security officials who arrived an hour later and as we were being escorted out I saw five or six bodies outside the hotel. Once he was a safe distance from the hotel, Tayeb called his colleagues still trapped inside the burning building. “Some were crying that they would die of smoke inhalation,” he said. Dramatic television footage from Afghanistan’s Tolo News showed people trapped on balconies at the top of the building climbing down bedsheets to escape, with at least one losing his grip and falling. A witness told AFP that the hotel’s security team fled “without a fight”, leaving guests to their fate. “They didn’t attack. They didn’t do anything to them. They had no experience,” said the 24-year-old man, a hotel employee who spoke to AFP on condition of anonymity. An interior ministry spokesman has confirmed to AFP that the hotel’s security had been taken over by a private company just three weeks earlier. No hotel official was immediately able to comment. As he waited for news of his colleagues, Tayeb updated his Facebook status to thank his friends for their prayers. “Staying alive in this country is a mere coincidence,” he wrote, before making another plea. It was too late for one of them: the interior ministry confirmed at least one person involved in the conference was among the dead.